While we are big fans of research, we disagree with Current’s recent op-ed asserting that public radio’s future success in fundraising depends on new studies. In our experience, doubling down on the recommendations of existing research is one of the best ways to grow the membership base and revenue. Public radio’s Audience 98 project summed this up neatly by showing that programming is the cause of giving; it is the why. Fundraising is the catalyst for giving; it is the how. The rest of this article focuses on the why part of the equation. In the commentary, Wisconsin Public Radio’s Michael Arnold argues that research models such as the Giving Path and Stairway to Given are based on logic from a different era. Both describe the steps a listener goes through to become a contributor. Arnold questions whether digital technology and changing demographics have diminished research findings about these models, which have served public radio for decades. Arnold is not alone in holding this view. And, he says, public radio now serves many audiences rather than one. The research findings that defined the Stairway to Given have been replicated and refined many times since 1985, when “Public Radio Listeners: Supporter and Non-Supporters” was published. The Giving Path and Stairway to Given emerged from the first comprehensive research on why some listeners give and some don’t, a study published by David Giovannoni in 1985. 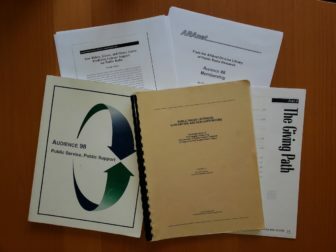 The findings of that study have been replicated and built on many times since, including as part of the Audience 88 and Audience 98 projects, research conducted by NPR’s On-Air Fundraising Partnership in the early 1990s, the Public Radio Tracking Study in the early 2000s and surveys conducted by individual stations. While some believe the durability of this body of research over decades is a fundraising liability, we see its longevity as an asset. The findings endure because they are not about public radio or public radio audiences. They boil down to a core finding about human behavior that transcends our industry: People act out of enlightened self-interest. In the case of public radio, people give because they are core listeners. When they rely on their local station, they become deeply loyal to the station. The content is personally important, and they would miss it if it were to go away. The Stairway to Given is a statistical model that demonstrates this to be true. The math shows how much more a giver listens than a non-giver. It shows that greater loyalty to a station creates a high probability of giving and of giving a larger gift. It shows how a giver places a higher level of personal importance on content than a non-giver. We think it is a fallacy to assume this model does not apply to people who consume content across our different platforms. To do so is to assume that concepts such as loyalty and personal importance don’t matter in the digital environment. That is a stretch. To support his argument, Arnold cites recent research by the American Press Institute showing there are nine different paths to becoming a newspaper subscriber. Nine audiences for one media service — that sounds a lot like public television. And it sounds a lot like public radio in the early 1980s, when conventional wisdom was that a single station should serve many audiences. Public radio’s audience and fundraising successes over the past decades are built on the foundation of serving a core audience well instead of fragmenting the schedule to serve multiple audiences. And while it seems counterintuitive, the public radio audience grew overall when stations focused on serving the core by creating a more consistent overall service. It was like building a stronger magnet to attract even more listeners. We believe the best way to ensure public radio’s fundraising success in the future is to approach digital service as a way to serve the current core even better. Think of it this way: Digital platforms are like a radio daypart. A station can choose to program a daypart for a separate audience, or it can choose to program a daypart to better serve its core. That service might still be a radio-listening occasion in the form of a stream. It could also be reading an article on a website, listening to a story on demand through a mobile app, reading a daily news update delivered in an email or listening to a podcast. It is worth noting that the Stairway to Given model demonstrates that core listeners to different services (news, classical, Triple A and multiformat stations) and different demographics (male, female, young and old) are all likely to act out of enlightened self-interest and give. The model holds. Some multi-licensee stations are doing quite well offering a news service along with one or two music services such as classical and Triple A. They became successful by understanding that discrete services need their own core audience to succeed. The question moving forward isn’t whether public radio’s fundraising framework remains valid. Meaningful content consumed loyally over time creates potential givers. It is an enduring concept that transcends formats, platforms and demographics. For future fundraising success, the question is whether stations will continue to embrace the lessons public radio learned about providing a significant public service by earning a significant core audience. John Sutton, GM of WESA in Pittsburgh, spent 20 years as a consultant providing research, programming and fundraising services to public radio stations and organizations. Earlier in his career, he co-directed CPB’s Listener Focused Fundraising project, worked as an analyst for Audience 98, and founded NPR’s On-Air Fundraising Partnership. He also worked at NPR for a decade, including several years as its director of audience research. Sonja Lee is president of Sutton & Lee, a public radio consulting firm. Over the past 11 years, she has helped dozens of stations produce more efficient on-air pledge drives. Current and past clients include WQXR, New York City; WGBH and WCRB, Boston; WSHU, Fairfield, Conn.; KUOW in Seattle; KUSC in Los Angeles; WLRN in Miami; and KPBS in San Diego. A lot about media has changed since the ’90s. Unfortunately, our core ideas about why listeners give to public radio haven’t. Thanks for responding to my piece. While I agree that many aspects of the past research on fundraising still hold, I still believe we need more research. Personal importance and core still matter. I just think we understand why listeners value our service at a time when we are doing many more things for them. Without research that connects personal importance to our current services, we lack the information we need to make smart decisions for the future. In your piece, you recommend that stations focus all its digital content on core users. How would a station know to do that without some more research? It would be a mistake to assume your web users are all core listeners, for example. I also think “thinking audiences” isn’t a bad place for public radio to go right now. At a time when technology will allow us to provide highly personalized experiences to our users, I think we need to get a better handle on how to think about multiple constituencies. Organizations that run multiple stations already do this. We need to increase our level of sophistication to be able to do this with our full portfolio of services. I think more research can help with that. Mike, we agree that stations should always understand their audience and constantly evaluate the value and effectiveness of their content offerings. But that’s not the role of fundraising research. It never was. One of the key principles followed by industry researchers over the years is that donors don’t drive content decisions. That’s why pledge drive results should never be used to determine whether a program stays on a schedule. That’s why there have not been national donor studies to evaluate programming. Audience metrics and recontact studies that include data about all of our consumers are appropriate for assessing the value of content and the effectiveness of how it is delivered. Donor information can be a valuable part of that research and its analysis. But that’s much different than a “donor-first” approach to deciding where to invest programming dollars, which puts money ahead of public service. As noted at the top of our article, we are big fans of research. But we also believe it is important to use the right tools for the job. Programming research is the tool to help us evaluate our public service. Fundraising research is the tool to help us unlock the financial value created by that public service.